For nearly two years an exhibition of paintings by George Demont Otis, including a number of paintings now being exhibited at the Sonoma County Museum, was held in the California State Library in Sacramento. It was by every measure a great success. Not only did art connoisseurs enjoy these paintings, they were enjoyed by hundreds and hundreds of Californians who were experiencing, some for the first time, the power of landscape art, as evidenced in Otis' work. George Demont Otis is one of those American painters who remind us what landscape painting is all about: the re-envisioning of the familiar, the spiritualization of the ordinary, the discovery of pattern and poetry in the natural environment. One does not need a doctorate in art history, nor even an experienced eye, to be drawn into the compelling world of these paintings. True, it helps to know that George Demont Otis ensconced himself in a rustic cabin in the township of Kentfield in Marin County in 1934 and spent the next twenty-eight years painting the North Bay. It is also important to note that Otis became the leader of the Western Impressionist School, and that his work demonstrates the continuing vitality of Impressionism and Post Impressionism through the upheavals of the 1930s, the war years, and the postwar boom. Building upon the prior work of his painterly predecessors in Marin, Thad Welch and Percy Gray, Otis celebrated in dozens and dozens of delightful canvases the compelling landscape, flora and fauna, and enchanting atmospherics of the North Bay. All in all, Otis' work represents one of the most comprehensive documentations through art of a California region. Because of Otis, we can ever re-experience the beguiling presence of a sea and bay-girded, eucalyptus-guarded landscape, its hills lion-colored or green, depending upon the season, its skies suffused with a golden mellow light. Not only does George Demont Otis document for us a world we almost knew - a world increasingly threatened by growth and development - he does it in a most non-intimidating manner. Otis' paintings are, first and foremost, a pleasure to regard. Simply, directly, honestly, Otis presents to us what he is seeing with a skill that abhors pretension and a regard for color that prefers subtlety to fireworks. In this carefully curated exhibition, we can enjoy not only many of the best paintings by George Demont Otis, we can also celebrate the North Bay in all its composite glory, including its historical reverberations. Through Otis' eyes, for example, we see the Valley of the Moon not only as Otis saw it, as an enchanted glen in which eucalypti and oak stood sentry, but as Jack London saw it as well, a generation before Otis, and established there his Beauty Ranch: as the embodiment, that is, of all that the North Bay, including Sonoma County, offered in the matter of California living. Are we aware today that our marshlands and tidelands are among our most precious and endangered landscapes? Then let us behold a Marin inlet as painted by Otis in the 1930s, with a stately heron standing between a shore of gold and an inlet of azure blue and mountains and sky sweeping across the horizon. Here is a painting sufficiently capable in and of itself to convince all of us that such places, such moments of natural repose and beauty, must forever be kept possible through proper stewardship, lest we lose the essential meaning of California itself. For other examples of stillness and beauty, let us follow with Otis along Inverness Creek as it runs into Tomales Bay at Point Reyes or survey the marshlands which eventually became Hamilton Field as they awaited their human history. Seeing Mount Tamalpais through Otis' eyes, hazy and mysterious in the distance, we can understand why the Miwok people considered it sacred; and from this painting, and from so many others of Otis' as well, we find ourselves mysteriously bonded to our region, if only in desire, as were the Miwok, the Castanoans, and the Ohlone. 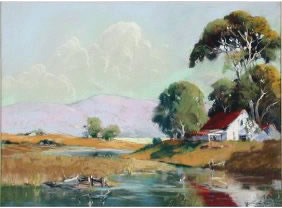 Himself living in a Kentfield cottage, Otis showed a preference in his paintings for intimate and rustic architecture in dialog with landscape. The paintings in this exhibition abound in charming vernacular buildings, at one with their surroundings. From these vernacular buildings, paradoxically, so seemingly haphazard in the siting and construction, emerges a conviction of civility: a sense of people and landscape in harmony, found by so many painters, including many Americans, in the South of France, but found by Otis on the Mediterranean-like sunny shores of the North Bay. Indeed, one of the great pleasures of viewing Otis' work, aside from the ever-present eucalyptus, are the glimpses he affords us of the built environment: the Palace of Fine Arts seen from the Presidio highlands with Alcatraz in the distance, the cottages and suburban villages of the Belvedere Peninsula, the working wharves of San Francisco, or the city seen across the Bay from Sausalito on a moonlit night, an iridescent back-lit Atlantis rising from the sea. Of continuing importance in any Otis painting are the trees: the eucalyptus, first of all, imported from Australia and taking to the Bay Area like a native plant; but birches and sycamores as well, and the equally paradigmatic Monterey cypress and redwood. These trees bespeak California in a special way, and no one has caught their presence and grandeur more lovingly than Otis. During the Otis exhibition at the California State Library, visitor after visitor took the time to come into my office and tell me how much he or she had enjoyed Otis' work. Again and again, two themes emerged in these conversations. George Demont Otis has introduced so many first-time viewers to the power of art as a way of re-envisioning the world around them. George Demont Otis has again and again helped them see - and thus appreciate - California in a new and better way. And now the opportunity that was available in Sacramento - the opportunity to experience a skilled, loving, celebratory, and accessible California artist - moves to Santa Rosa, to a city and a museum on the northern edge of Otis country. How wonderful, then that these paintings are coming home to the northern boundary of the region which nurtured Otis' life and work. That region, Marin and Sonoma counties, remains in so many ways as beautiful and compelling as it was the day Otis established his home in Kentfield in 1934 and dedicated the rest of his life to seeing and documenting through art his chosen and beloved landscapes.